It’s time to say good-bye to my first babies, the remaining copies of Adirondack Attic 1, which are out of print. Cleaning my “warehouse” the other day, I found there are only five copies of “New York State’s Mountain Heritage: Adirondack Attic, Vol. 1” left at Hungry Bear Publishing. With Christmas approaching, it’s time to sell them, but only as part of the full Adirondack Attic collection, volumes 1-6. The Adirondack Attic book series includes more than 300 stories about artifacts at the Adirondack Museum in Blue Mountain Lake, New York. 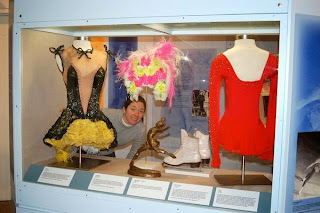 I worked with curators at the museum to tell the human stories behind the objects in their collection. The retail price is $106.95 for a full set (plus 8% NYS tax). I’ll also throw in free shipping, a free Adirondack Attic bookmark with each volume, and a free copy of my 2013 book, “New York’s Adirondack Park: A User’s Guide,” a total value of $26.45. 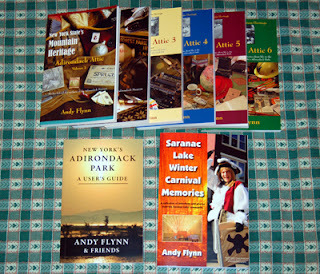 With a full set of Adirondack Attic books, you can also get my latest book, “Saranac Lake Winter Carnival Memories,” for only $19.95, a savings of $5.00. This way, you can have my entire collection of books – 8 in all – for $126.90 (plus 8% NYS tax). All books will be signed, and you may have them inscribed with a personal message if you’d like. For this special offer, please contact Andy Flynn at adkhungrybear@yahoo.com or at 518-891-5559. You cannot purchase this full collection online, only by contacting the author at Hungry Bear Publishing. ONCHIOTA – There's a good chance John Fadden's Mohawk ancestors used the dugout canoe in his family's museum. Then again, nobody really knows for certain. The best guess, using carbon-14 dating sent to a laboratory this summer, is that the canoe - found submerged in Lake Placid lake in the early 1960s - dates to between the mid-1600s and the late 1800s. Using Native American history in New York state, this gives the more likely timeline between 1669 and 1780. 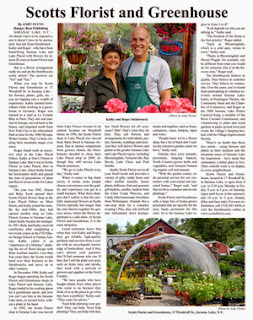 Read more in Andy Flynn’s Lake Placid News story. Listen to Andy Flynn’s "Adirondack Attic" report on North Country Public Radio.